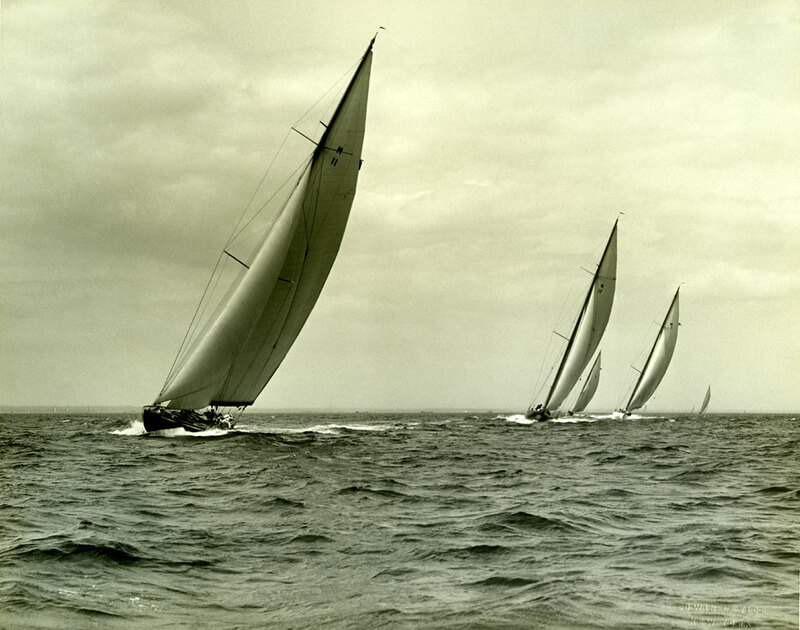 In addition to the J-boats, Tysnes sailors sailed other classes, too. These are M-boats in a regatta. Venelaget for jåttseglarane (the Yacht sailor exhibition charity, founded 3 February 2009) has 45 members, among whom several with fathers or close relatives once employed as crew members or officers aboard the yachts. A central task is to draw the audience’s attention towards Tysnes locals’ part in American yacht sailing and America’s Cup between 1900 and 1940. The Tysnes dialect’s written version of “yacht” is “jått”, in order to secure a pronunciation similar to the English (which could otherwise end up sounding quite differently). The emigration from Tysnes to America was considerable. 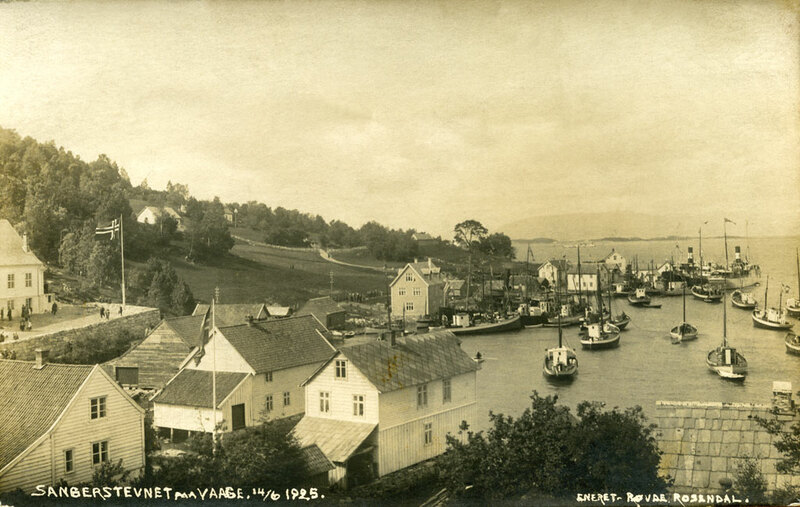 A panorama of Våge, the commercial centre of Tysnes, in 1925. The majority of sailors were from Våge, Lunde amd Reksteren. Another goal for the exhibition is to show a display of life in the Tysnes community some 100 years ago, in addition to the conditions that met the emigrants the other side of the Atlantic. The Sunnhordland Museum is an important partner, supervising the technical aspects of the collection, and providing a professional take on presentation, conservation and curation. Following the exhibition’s opening, the charity has received new information and tips concerning the yacht sailors, as well as new items that have since been found. Jaattlaget.com serves as the charity and the exhibition’s website, and a purveyor of the adventures of the many Tysnes locals who served as crew members on board American yachts for the better part of the 20th century’s first half. We have tried to keep the information as structured and logical as possible. The left hand side menu is made up of sections, each with its front page, as well as subcategories for detailed fragmentation, where needed. We sincerely hope you will find our information useful, and of course, that we will have the honour of your presence in the Våge exhibition (please see this page for further details on the exhibition and its opening hours). Interviews with veteran yacht sailors and their offspring, articles in American and Norwegian newspapers and magazines, literature pertaining to sailing in America at the time in question, correspondence with museums and American yacht clubs, as well as the website www.norwegiansteam.com, courtesy of Mr Kjell Magnus Økland. Most pictures are copies of photographs currently the property of yacht sailor descendants.